It’s high time for another batch of mini news items. Strap in, here we go! – First up is some good and bad news. Steven Spielberg has landed the rights to the war photographer memoir, It’s What I Do: A Photographer’s Life Of Love And War, with Jennifer Lawrence set to star. There were a number of big players vying for the rights but I guess once Spielberg steps into the ring, it’s lights out for everyone else. What has this got to do with Natalie? Well it seems her Black Swan director, Darren Aronofsky, was trying to get the rights for Natalie to star. The bad news is evident but for me hearing that Natalie and Darren are keen to work again is even better news. You can read about the hotly contested auction over at Deadline. – Next up is an impassioned defense of Thor 2: Naptime. I’m glad the guy loved it so much but I feel his plot focused arguments miss the point. All the Marvel films generally have ridiculous plots that you could pick apart if you so wished. What makes them work or not is caring about the characters and the journey. So arguing that Jane Foster needs to be there to give Thor a reason to want to save earth is fine, but it if we don’t feel the connection between them on screen then it’s just words on a page. – Finally, a new Italian interview with Natalie can be read here, although it will need a translation. Below is a small excerpt. Never been a party girl? Never. I have always understood the lightness as a state of mind that does not need to prove such excesses. I happened to go to parties apparently exceptional, but to go home with the feeling of having wasted time. A nice selection of mini news items for you guys to dig into today. – Natalie has received a Teen Choice nominationattending a Miss Dior cocktail party in China on Thursday. I guess the report that she would be attending the Shanghai International Film Festival is right on the money. – And finally, a little mention that A Tale Of Love And Darkness has landed distribution in Italy via Massimo Ferrero. Thanks to Kitten and Belerofonte. We also learn in the party scene that Jane is no longer with Thor! The poor Asgardian is at the bar watching Jane with Richard (Chris O’ Dowd’s character from Thor: The Dark World). Supposedly, he is ok with it. He’s fine. Supposedly. So, does that mean Natalie is in the film, albeit in a cameo? Sounds like it, although they probably have enough footage to fake it. As for the story detail, it could mean that Jane is being written out of the universe, but I think it’s more likely just an excuse to have the character not in the film in any significant way. They can’t exactly have Thor apologizing to Jane for ignoring her to save the world again in Thor 3, so this time she’s broken up with him. That would be my guess anyway. 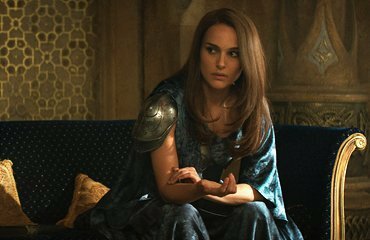 If you’ve been checking the gallery recently, you’ll notice we’ve updated with over 450 Blu-ray screen captures of Natalie’s action-packed turn as Jane Foster in Thor: The Dark World. We’ve updated the gallery with a few more new-old Thor: The Dark World production stills. Thanks to Kitten for the finds. Two more can be found after the jump. We’ve updated the gallery with some Thor: The Dark World costume test photos and behind-the-scenes snapshots of Natalie with costar Chris Hemsworth and makeup artist Eileen Kastner Delago on the set in London. Thanks to Kitten for the finds. Time for a new poll and I’ve decided to make it about the Thor 2 deleted scene. I’ve already said how much I liked it (until a certain point) and now you have the chance to tell me how wrong I was. As this clip begun I was already writing a joke in my head about Natalie’s Jane and her perpetual sleepiness in Thor: The Dark World, but the scene is actually pretty good and while “essential” is probably overselling it, I do think that little moments like this which fill in the reality of the world can only help engage audiences. I’m not crazy about Jane’s 13 year old science geek dialogue but the rest is great. We have quite a few Thor related news items so I’ve decided to put them all together for a new hammer themed edition of tidbits. – We start with confirmation that Thor 3 will be a part of Marvel’s phase 3. After the second film I can’t say I’m really looking forward to that, but I know many of Natalie’s fans will be punching the air. – Next up is a piece of concept art from Andy Park. – And here is a new(?) photo from the first Thor film. – Finally, a Thor 2 interview with Natalie touches on a few other aspects like how she regrets not being more rebellious as a teenager. For Star Wars fans there is also what Natalie said to JJ Abrams about the upcoming series. Thanks to lightscamerareaction, MrsKiraSayers and Belerofonte. So, having finally caught up with Thor 2 I thought I’d give a few comments. Not many mind, because there’s not much to say. I’ve maintained that the problem with the Marvel films is that they are never trying for greatness. They’re very safe. So you’ll rarely get something amazing (I think Avengers was close) but you’ll also never get a total car crash. Well, for me Thor 2 was as close to a car crash as they’ve gotten. The first film wasn’t great but it had it’s charms. Thor being the fish out of water was silly but a lot of fun. In the sequel Jane takes on that role and…let’s just say it doesn’t work as well as the first film. Jane and Natalie’s performance is a real problem here. At one point she literally falls asleep in the middle of the action, and the drop off in presence from wake to asleep was barely negligible. Natalie looks so so bored, the kind of blankness of performance that reminds me of Star Wars. And when she’s not bored she’s acting like a 16 year old. I happened to see a scene of Natalie as a 13 year old Marty in Beautiful Girls on the same day and that little girl character feels more mature and 3 dimensional in just a couple minutes than all the Jane Foster scenes put together. I know the Thor films are these huge scale “epic” adventures, but just a handful of scenes like that would really raise the stakes in the big moments. Instead we get an important character dying but we’ve never had even half a real moment with them in either film, so it feels empty. All sizzle, no steak. There were a couple decent action beats and the final action set piece has a creative angle that helped make it feel a little bit more fresh than the stock standard city devastation. – Thor 3 has landed itself a pair of writers in Craig Kyle (produced both Thor films) and Christopher Yost (co-wrote Thor 2) so…errr…woohoo? – Speaking of Thor, here is a preview of the second film’s gag reel, as a way to promote the upcoming home video release. There are a couple cute but fleeting Natalie moments. How Big Did It Get? The film was helped by a smart rollout strategy that kept it playing regional festivals and advance Q&A screenings prior to its wider theatrical release, so it picked up several “breakthrough” type awards and built word-of-mouth. It ended up pulling in $35.8 million worldwide, making it hugely profitable even after having been bought for $5 million (twice its production budget), and earned Braff a Grammy for the indie pop, Shins-heavy soundtrack. But beyond the numbers, “Garden State” was an early example of what has come to be seen as kind of the Platonic ideal of the Sundance movie, for better or worse: independent but with recognizable stars; helmed by a first-timer destined to be hailed as a wunderkind; dealing with the neurotic, white, middle class American experience. Thanks to Lightscamerareaction and Belerofonte. For the sake of Natalie news, I can’t wait for January to start already. – An end of year tradition is the annual TC Candler 100 Most Beautiful Faces list. Natalie always does well and won it in 2008, but this year she only managed 33rd place. Always enjoy their list because the choices tend to be more interesting/inspired. For the first time they are presenting the list in video format. – Thor: The Dark World passed the $200 million domestic mark a few days ago. It’s at the end of its run now but at almost $630 million worldwide, which is a nice bump from the $450 million the first film made but still a long ways off what Iron Man can do. – Finally, a little shout out to Christophe, who you may remember translated my Mathilda script to comic form. He has a new comic book out, which you can learn about over on the official Facebook page. You know the state of Natalie news is dire when Dazza asks one of his minions to post the unfocused forum mini-review she wrote on her lunch break on the main page. 😛 If you haven’t seen it yet, don’t worry about spoilers. It’s been almost two months since Thor: The Dark World was released in theaters, so that should probably give you an idea of how excited I was to go see it. Brace yourself for my enthusiasm. I went in with fairly low expectations, and I hate to say I was still kind of unimpressed. The story was half-baked, the action scenes were generic and unremarkable, the camp was over the top, and the whole thing felt overly long despite the frentic pace. Belerofonte nailed what I was scratching my head over in his review: one of Thor: The Dark World‘s biggest problems is that it feels like a condensed version of a grander tale. The film also struggled to find a good balance between being silly and serious (the first Thor movie did this much more successfully). One of my big gripes with Thor is reversed in its sequel. This time, everything set on Earth really worked for me, but Asgard fell flat. I found myself losing interest when Thor and Loki weren’t onscreen, which was entirely too often. Mads Mikkelsen really dodged a bullet, because the villain was lame, lame, lame. 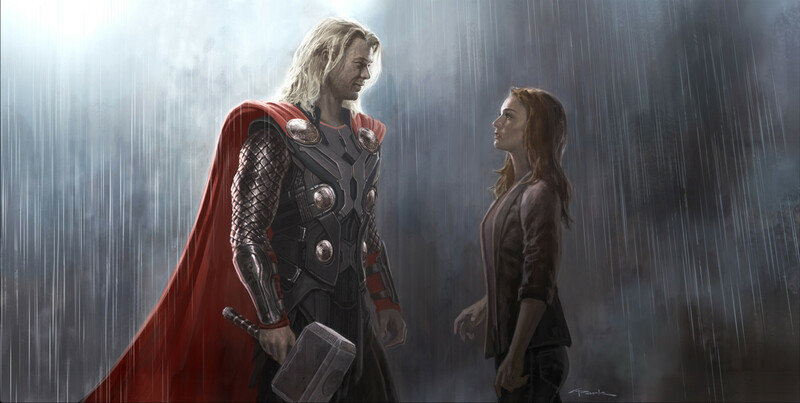 And the lukewarm romance between Thor and Jane was still pretty lame, too. Maybe the romance would have worked if Natalie and Chris Hemsworth had any onscreen chemistry (they don’t), but I’m betting it would have still felt really awkward and forced. Unlike the other Marvel movies, there are too many characters on the canvas and just not enough time to focus on all of them. Characterization was either an afterthought or left on the cutting room floor. This is a superhero movie after all. A straggler video from the Thor media tour finds Natalie making the interviewers day when expressing her love for Seattle after her recent visit. It’s quite a cute interview and we have Fanatical to thank. A nice versatile batch of mini news items today. Enjoy. – First up, if you really found yourself drawn into the final kiss between Thor and Jane in Thor: The Dark World, prepare to be disappointed. It wasn’t even Natalie. She explains why and who the lips belonged to. – Sticking with Thor, if you haven’t seen the film yet (and I’m guilty as charged) maybe this Japanese trailer, with more footage, will convince you. – Christian Bale has spoken about the Terrence Malick films and thinks that he won’t make the final cut of the Untitled project (the one set against the music scene) as he was only able to spend 3 or 4 days on it. He will definitely be front and centre for Knight Of Cups, the other Malick film (for those late to the party, Natalie is supposed to be in both films). He also sounds pretty excited about both projects and the enthusiasm that Malick is showing in the post production. Bale has worked with Malick before, so maybe he’s seeing a different side to the director. Maybe a more fast paced process, compared to some of the epic post productions on his past films. “I’ve been doing that for months. Terry is on fire. They’re both going to get finished. There’s no doubt about it. WHEN, I can’t tell you. But they’re both going to get finished. He’s just lit up. He’s possessed.